I doubt anyone out there will disagree about one of the best ways to express our emotions (or one of the best ways to evoke emotion) is through song. Music speaks to us in a much more powerful way, on a very daily basis. With everyone’s favorite Hallmark holiday just over the horizon, I began to wonder what percentage of songs written are all about love. My hypothesis was about 75%, running the gamut from unrequited love to “hit the road jack.” The ever reliable Wiki Answers insisted it was 60% – yet I’m inclined to believe that answer is only about being in love. On our very first Valentine’s together, my husband (then boyfriend) wrote and performed a song just for me. I kept a handwritten copy of the lyrics in my wallet for years until it began to disintegrate. He proposed to me during a concert while the lead singer sang about how his wife’s love saved him from his destructive behavior. That song spoke enough to my husband that he felt that moment there was perfect for him to ask for my hand. While songs like that may have highlighted the sweeter side of love, we shall not overlook what I like to call the I Want You to Want Me genre of admiring that special someone from afar. And I don’t think we can offer a passing glance at songs written from the perspective of lovers scorned (I think Adele’s six Grammy Awards illustrate this point quite nicely). There is also the Should I Stay or Should I Go set about lovers torn about the state of their amorous future. 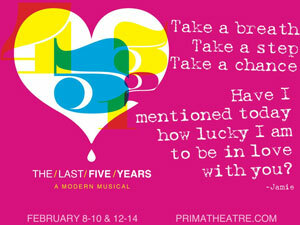 In PRiMA’s production of (the Jason Robert Brown musical) The Last Five Years, we experience this full range of emotion, entirely reflected in song. Centered around successful novelist, Jamie and the struggling actress Cathy, The Last Five Years moves lyrically through this young couples infatuation about their first meeting (“Shiksa Goddess,” “Goodbye Until Tomorrow”) to the ultimate dissolve of their marriage and the bitterness it has left both in (“Still Hurting,” “I Could Never Rescue You”). And, even more interestingly, this story only moves chronologically through Jamie’s point of view, while Cathy reflects the relationship from the end back to its beginning. Despondent and delightful, heartbreakingly humorous, the Last Five Years offers up what words sometimes cannot. And it is also why sometimes we have to say I love (loathe, like, want, need, can’t stand) you in a song. Steph is a full-time stylist at Plum Salon and Spa, a part time blogger extraordinaire for PRiMA Theatre Company. Check out more of her zany musings at primatheatre.com.